Why is Walker Berry a Star Volunteer? It just might be because he did not let being a 3l stand in his way, he just completed the 30 hours of Lexington County Juvenile Arbitration training. He even volunteered during the training for the mock hearing! Now he will be listening to parents, victims and young offenders as they each describe an event and decide what sanctions should be be levied against the youth. It is all about getting a second chance to make a better decision! 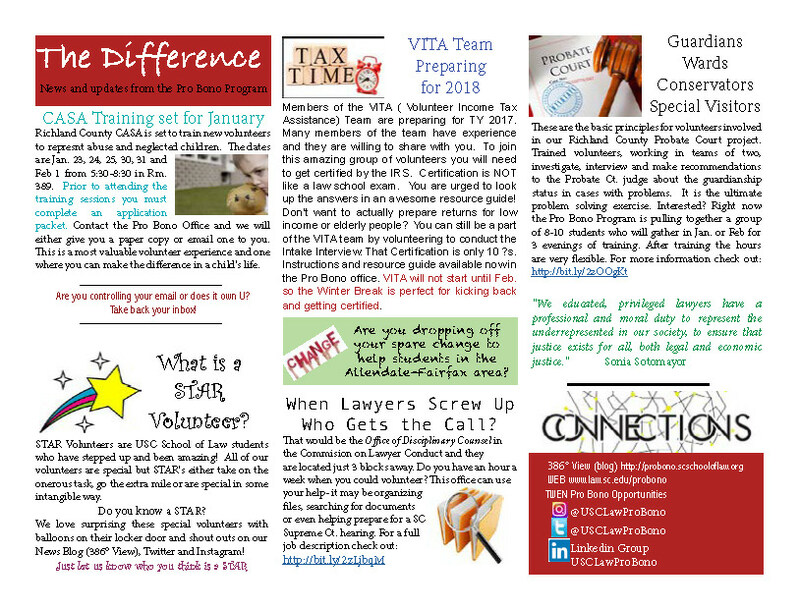 This entry was posted in Administrivia, Star Volunteer on 3 October 2017 by Pam Robinson. Why is Grace Chandler a Star? She stepped up in the Spring for a dull project- data entry! Yuck. The Pro Bono Program needed someone to enter the information on the Intake Forms from the HELP-Homeless Legal Clinic. This was a routine that required someone who could decipher lawyer handwriting and acronyms and Grace was up to the challenge. She would drop in between classes to enter date. 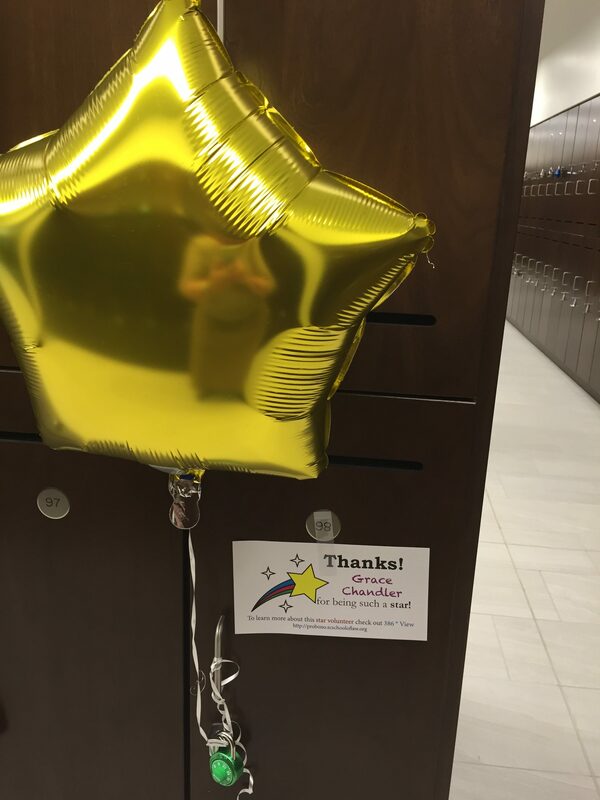 What is extra special about our Star Volunteer! She is continuing this project this semester! The HELP forms piled up over the summer but Grace is here between classes and spading assignments entering data. 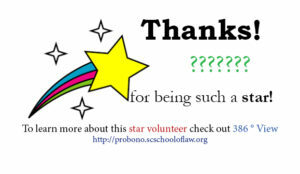 For her dedication to this simple but necessary task Grace has been named a STAR volunteer by the Pro Bono Program. 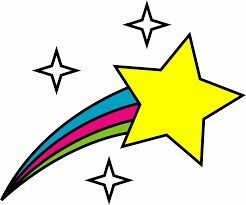 What is a Star Volunteer? 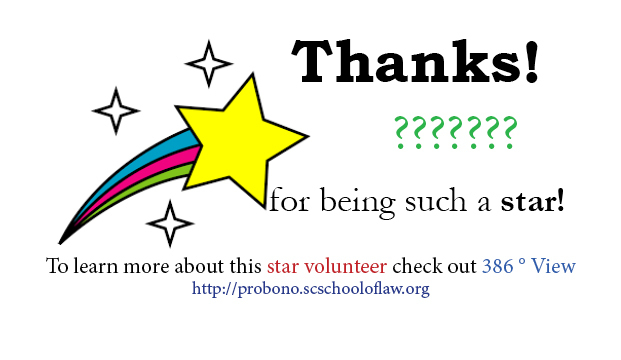 A Star volunteer is someone that the members of the Pro Bono Program Board believe has jumped out ahead and just done a great job. It may be a small project, a one time event or just a difficult task that needed to be done and they stepped up with a great attitude. There is no regular pattern to this recognition. You can’t apply for it, It will happen spontaneously and without notice. Suddenly a Star Balloon and a sign appear on your mailbox announcing that you are Star Volunteer. Information about what volunteer efforts you made will be posted on this blog. Enjoy your moment in the stars and know that you are being appreciated.